Toshiba took up production of pocket computers not so long ago, but the onset loots promising. The company launched three models, each being a unique solution in its area. 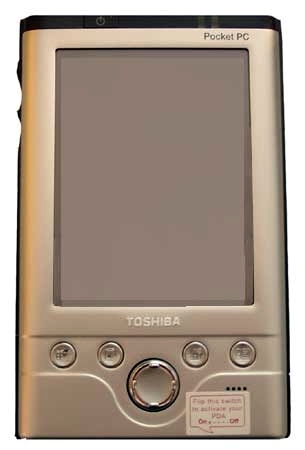 For example, the Toshiba e310 was the lightest and most compact handheld based on the Pocket PC 2002 (at present, the baton is taken by the Asus MyPal A600). The middle model is Toshiba e570. And the e740 is the most functional. The latter incorporates all cutting-edge features. It certainly is stuffed with all standard functions typical of the PocketPC 2002; like the Fujitsu Siemens Pocket LOOX and Siemens SX45, it comes with two card readers for CompactFlash type I/II and MMC/SD. But the most interesting component of the Toshiba e740 is a built-in module of wireless data transfer IEEE 802.11b (aka Wi-Fi). There is also a version of the e740 with a BlueTooth module or even without any communication means (except an IR port). But today we are dealing with the American version of the e740 (with Wi-Fi). The casing is made entirely of aluminum alloy. The buttons are plastic. On the whole, the computer has a high-quality look which is able to help its owner in most queer situations. Its austere look excellently suits a businessman. Its lacks a futuristic design, like for example, the iPaq 3800/3900 has, or a roundish shape of the Pocket LOOX. But tastes differ. I have no complains about the casing, but there is something I don't like about the buttons. A side dictaphone button and a power button, located in the upper right-hand corner, are made of low-quality plastic. Thus, it's not so often you are able to turn on/off the computer and enable the dictaphone quickly. Hot keys situated right under the screen and joystick look good, though the joystick is too small, like that of the LOOX. 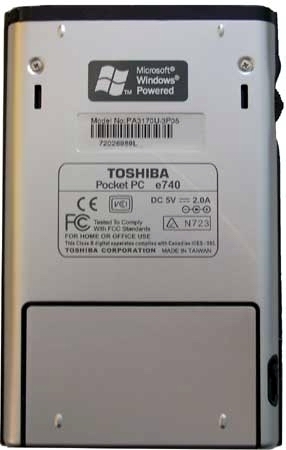 Compared with other Pocket PC 2002 based models, the Toshiba e740 is not light or slim. Its upper part integrates two extension slots (in the LOOX a CompactFlash slot is above and a SD/MMC one is on the left panel). MultiMedia cards can be ejected easily - by pressing. To fish out a CompactFlash card you must press a special small lever (to the reader's left), like in some digital cameras (Casio QV-4000) and most notebooks with PCMCIA slots. When the card is taken out, this lever remains out. You must use a stylus (not a finger) to push it back into the case so that it gets fixed there. The stylus is not an ideal match for this case: it's not so easy to put it into its "pocket" and draw out. Besides, it looks too childish, as if it was taken from a child's meccano. However, this pointer fits the hand perfectly and it's easy to use. As compared to the stylus of the Casio E-125, this one is not just a stick but a normal accessory of the PDA. In operation the computer looks ordinary. Images are always well seen: a bit worse in the sun and a little better in the shadow. It's inferior to the iPaq 3900 and Fujitsu Siemens Pocket LOOX, but the Toshiba's solution meets the needs of an average user. The only drawback of the screen is that it's brighter in the center than on the top. Unfortunately, you can't work without backlight at all: even at its lowest level there is some light, though when the backlight goes after (after the certain time) image are well seen even in a sombre room. Thus, it's possible to work without the backlight, but this function is not implemented here. I wish it were because it could prolong the run-down time by a couple of hours. There are two LEDs above the screen. One goes on when the battery is charged up, and the other when the Wi-Fi module is used. However, they are both orange, and it's easy to confuse them. The charger allows you to either charge the e740 in the cradle or plug it directly into the e740 for charging without the cradle. Unfortunately, the cable used to connect the PDA and a desktop PC can't be separated from the cradle. In this respect, the Pocket LOOX has the most convenient design of the charger, USB cable and cradle: all of them can be used separately. There are two switches apart from connectors for a desktop PC and power supply unit. One of them is meant for the Wi-Fi module, and the other for power cutoff. They look very similar to each other, though they are marked differently. The letters are so minute that we confused these switches twice. As you know, if you switch off a battery, memory cleans up. Well, it certainly is unpleasant when instead of turning on a WiFi module you accidently implement hard reset when you are going to test a newly installed program for operation with a LAN. In the Fujitsu Siemens' PDA, where the hard reset is implemented the same way, this switch is under a shutter which protects it from accidental data loss. If you remember, the LOOX sports an excellent light sensor. Well, the Toshiba e740 lacks it. It's excusable for old Palms which can "overwork" lots of PocketPCs, either with backlight or without, especially monochrome models. But when every minute is accounted for (in a mobile device), such an approach of Toshiba is not clear. I know that many users just fix backlight and forget about it, but we have to test PDAs from head to foot and to work with an auto backlight if possible. Nevertheless, a light sensor is not an unnecessary component. It's very helpful, for example, when you are in a moving car. When you get into a tunnel, a blinking screen might irritate you, but you don't always feel a desire or have a possibility to adjust it manually. However, there is one thing that looks better in the e740 than in the LOOX. It's a cover :-). The Siemens's model comes with quite a poor one. Toshiba seems to have spent much more money on it. It's made of leather (maybe leatherette). Besides, the front part of the cover is hard inside which protects from accidental pressing on the buttons, though sometimes it did took place. One more thing the e740 outshines its competitor in is a replaceable battery. It can take you just a couple of seconds to take it off. It's crucial if you have no time or possibility to charge the device up at least once a day. However, in this case you can get an additional battery made as a jacket in case of the iPaq. The run-down time prolongs by 12-15 hours, but we couldn't test it. The tested sample worked not much with the standard battery. We played mpeg files from the CompactFlash card, transferred data via Wi-Fi from time to time (the overall traffic was about 2-2.5 MB), and set the backlight to maximum - this torture was endured during 1 hour 40 minutes, and WMA files were played with the screen off during 3 hours. On the other hand, this sample takes few time to charge up. 30-40 minutes were enough for it to show a 100% level. I think it's a bug of the battery charging sensor which doesn't allow it to finish charging up. Like the Pocket LOOX, iPaq 3900 and Asus MyPal A600, the Toshiba e740 features a new processor from Intel - XScale clocked at 400 MHz. Compared to the preproduction version of the LOOX, the Toshiba's solution is much more efficient and stable. If we compare it with production versions of other XScale based models, we will find the speed gain minimal. Moreover, in some applications the iPaq 3800 works noticeably faster (for example, when looking through a large list of files in the File Explorer). Besides, in the synthetic tests the XScale based PDAs are not speedier than the StrongARM based ones running at 206 MHz. But it doesn't concern the Asus MyPal A600 which is being tested now in our lab. Well, as far as the appearance and controls of the e740 are concerned, we must say that the new PDA looks sound. And it's easy to use. The only thing that disappoints me is a lacking Action button and a poor implementation of the Power button. It looked as if it didn't work every time we used it. Nonetheless, after two weeks of working with it the Toshiba e740 left a very pleasant impression. P.S. Soon we will review the most interesting part of the e740, i.e. its Wi-Fi module, as well as a BlueTooth-CompactFlash adapter from Belkin. Stay tuned!